Gideon Welles and Samuel P. Lee revoke an appointment at the end of the war. GIDEON WELLES. 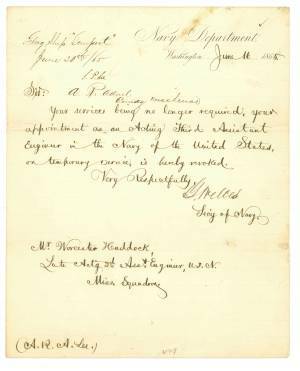 Letter Signed as Secretary of the Navy, Navy Department, Washington, June 16, 1865. Co-signed by Samuel Phillips Lee, Rear Admiral in command of Mississippi Squadron, June 20, 1865. On Navy Department stationery, to Worcester Haddock. 1 p.
Your services being no longer required, your appointment as an Acting Third Assistant Engineer in the Navy of the United States, on temporary services, is hereby revoked. Late Actg 3d Asst Engineer, U.S.N. Samuel Phillips Lee (1812-1897) was born in Virginia, and was a third cousin of Robert E. Lee. He joined the Navy in November, 1825, and served in the Mexican-American War. Lee rose to Acting Rear Admiral in the United States Navy during the Civil War. He commanded the North Atlantic Blockading Squadron (flagship, Philadelphia) from 1862 to October, 1864. In the final year of the Civil War, he commanded the Mississippi River Squadron. Lee was promoted to Rear Admiral in 1870, and retired in 1873.